You all know I love podcasts. One of my favorites, Big Picture Science, held an interview with Nicholas Carr (a journalist) on over-reliance in automation. The entire podcast, What the Hack, also covers computer security. To skip to the HF portion, click here. -points for falling back on the “we automate because we’re lazy” claim, rather than acknowledging that the complexity of many modern systems requires automation for a human to be able to succeed. Do you want to have that flight to NY on the day you want it? Then we have to have automation to help that happen – the task has moved beyond human ability to accomplish it alone. -points for the tired argument that things are different now. Google is making us dumber. Essentially the same argument that happens with every introduction of technology, including the printing press. We aren’t any different than the humans that painted caves 17,300 years ago. For more podcasts on humans and automation, check out this recent Planet Money: The Big Red Button. You’ll never look at an elevator the same way. *While looking up support for the claim that people have always thought their era was worse than the previous, I found this blog post. Looks like I’m not the first to have this exact thought. This NYT article discusses the “new” scourge of rude people interacting with their phones in public via voice thanks in large part to Siri, Apple’s new virtual assistant. This article reminded me of something slightly different about human interaction with virtual assistants or automation. In a 2004 paper, researchers Parasuraman and Miller wondered if automation that possessed human-like qualities would cause people to alter their behavior. They compared automation that made suggestions in a polite way or a rude way (always interrupting you). As you might expect, automation that was polite elicited higher ratings of trust and dependence. This might be one reason why Siri has a playful, almost human-like personality instead of a robot servant that merely carries out your commands. The danger is that with assistants that are perceived as human-like, people will raise their expectations to unreasonable levels. Like mistakenly ascribing political motivations to it. Everyone presented on issues related to human-automation interaction. I do not have their permission to show their slides so this post is more generally a lay-person’s description of one aspect of automation research: consequences of perceptions of automation reliability. One of the most popular types of news items we post is stories of when people rely too much on unreliable automation with sometimes funny or tragic consequences. For example, when people use in-car navigation/GPS systems and slavishly follow its directives without judging conditions for themselves. The Y-axis is how the user perceives the system’s reliability while the X-axis is the actual reliability of the system. Let’s focus on the two zones in the upper left and lower right represent. When the user perceives that the automation is more reliable than it actually is (RED CLOUD) they will over-trust the automation and perhaps rely too much on its occasionally faulty advice (this is where much of the GPS horror stories lie). People may get their mis-judgements about the reliability from many sources (marketing literature, limited use, or recommendations). For example, my digital camera has an auto mode that claims to be able to detect many types of settings (macro, landscape, night) and automatically adjust settings to suit. However, in practice it seems less reliable than the marketing literature suggests. 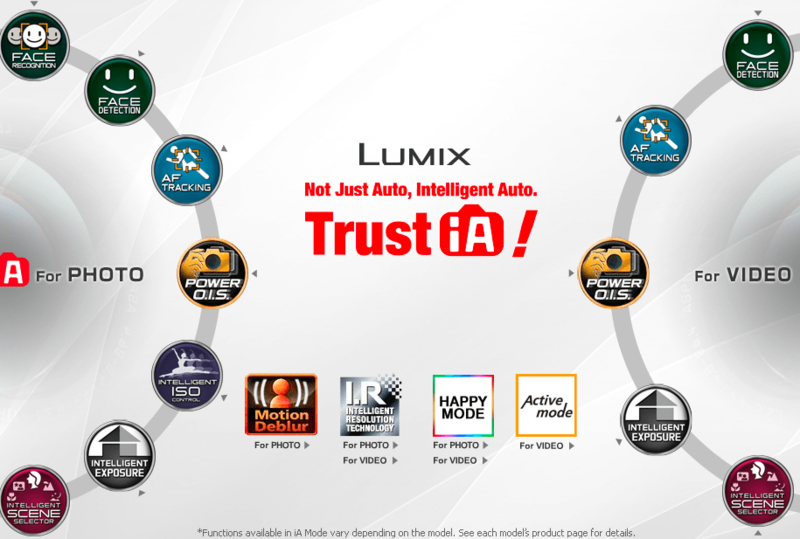 The company exhorts me to TRUST iA (their name for automation)! So in a few situations where I over-rely on iA, I end up with images that are too dim/bright, etc. The system doesn’t tell me how it came to its decision leaving me out of the loop. Now, I just don’t use iA mode. The other zone (YELLOW CLOUD) is less studied but it represents situations where the automation is actually very reliable but people perceive it as not very reliable and so will depend on it less–even when their performance degrades as a result. 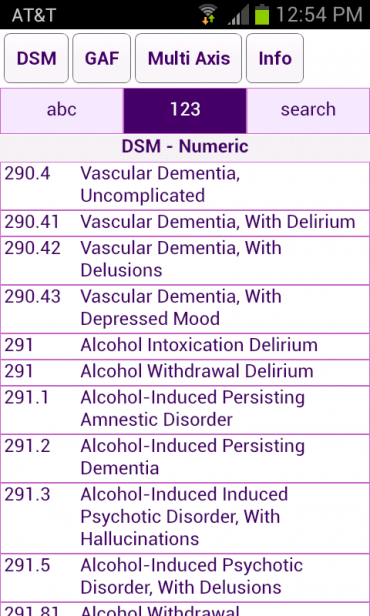 Examples are more difficult to come up with but one might be the example of health aids that doctors might use to assist in diagnosis of patients. 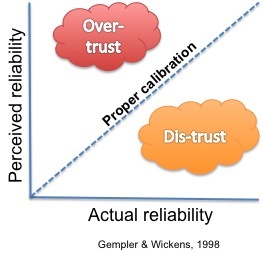 Finally, the line in the middle is proper calibration: perceived reliability is perfectly correlated with the actual reliability of the automation. This is where we want to be most of the time. When our calibration is perfect, we will rely on the automation when we should and NOT when we shouldn’t. Getting people to properly calibrate their trust and dependence on automation is a complex human factors psychological problem. Are we too trusting of GPS automation? A GPS certainly makes life easier — and although I think many of us might consider what would happen if we were without it or it was unable to identify where we were, it is less often we consider how it may lead us astray. One of our early postings on the Human Factors Blog was about a bus driver following GPS directions that led under a too-short bridge. His case was augmented by the fact that he had chosen the “bus” setting on the GPS and assumed any route produced was therefore safe for buses. The actual model of the GPS under the bus setting was only to add routes that only buses could take, such as HOV exits, rather than to limit any route. NPR just posted stories of people in Death Valley who got lost from following GPS directions down roads that no longer existed. In one of the cases, their car got stuck for 5 days and resulted in the death of a child. After hearing numerous stories about inaccurate GPS directions from lost drivers, a ranger investigated the maps used by the GPS systems and found roads included in them that had been closed for years. How accurate and updated do GPS systems need to be to be considered safe? How can they address over-trust in potentially dangerous situations (e.g., death valley)?